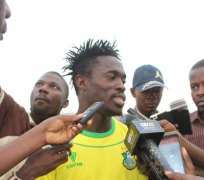 NPFL Rave of the Moment, Junior Lokosa is excited to end his mini goal drought after scoring a brace as Kano Pillars defeated Heartland 2-0 in Kano on Sunday. Lokosa, who is the highest goal scorer in the Nigeria Professional Football League, he is also the highest scoring Nigerian Striker in any league in the whole world. Lokosa failed to score in his team's last two matches before finding joy against bottom-placed Heartland. “I was disappointed with my performance in the previous two games against Wikki Tourists and Lobi Stars and challenged myself to do better in subsequent matches. “It’s good to see the hard work come to good effect. Now, I have to keep working hard and keep scoring and helping the team. “The win has put us in a good position in the table even though we are not at the top yet, but we will work hard to get there.